Summer is in full swing in West Virginia and when it is hot in the mountains ~ it is hot! Although, I know I shouldn’t complain as many of my southern friends would likely trade spots for a while. Anyway, yesterday morning while it was still somewhat cool, camera in hand, I went out to try and capture a few photos of ‘summer blooms.’ Other photos in this post have been taken during the last few weeks. Please be patient with my photography skills, I am still learning. 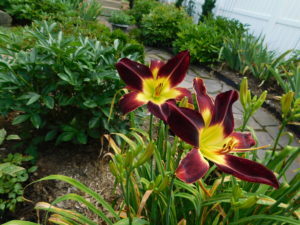 This is a special daylily, to us. Its name is ‘Tribute to Mike.’ My husband’s name is Mike and he loves red, so of course, this beauty had to have a home in our garden. 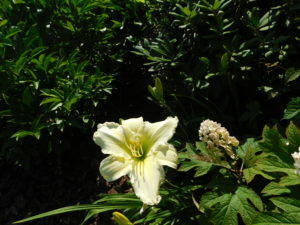 It is a prolific bloomer, and I am especially fond of the size of its bloom and its yellow/green throat. I do not know the name of this pretty girl. She was shared with me by my former neighbor and dear friend, Cathy. Don’t you love her colors? 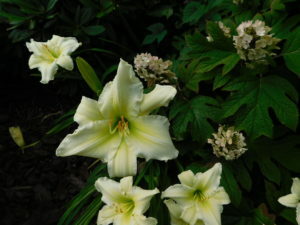 Large and ruffly white daylilies can be difficult to find. 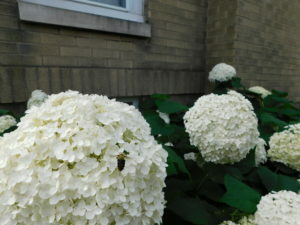 Clearly, Mr. Sandburg was not familiar with Annabelle hydrangeas. They do not “turn rust” and they do not “go soon.” Annabelles are hardy in zones 4 through 9, and their blooms are fabulous. They open in a chartreuse green, turn white and then back to chartreuse. Annabelle’s beginning to set on blooms. Annabelle’s in the morning fog, opening in their chartreuse color. Look who I found enjoying breakfast ~ a sweet Honey Bee. Honey Bee invited Bumble Bee! In the language of flowers ~ Presenting someone with a bouquet of hydrangeas means you are expressing your gratefulness for the recipient’s understanding. I love that. 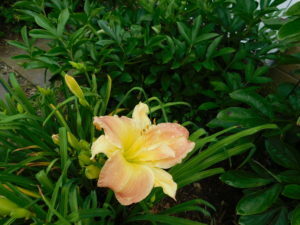 You probably noticed this guy in the photo with the Snow Queen daylily. 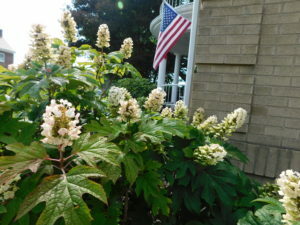 It is an oak leaf, leather leaf hydrangea. The texture of the leaf is wonderful and is magnificent as a foundation on an appetizer tray. The blooms open as a creamy white changing to a lovely rose pink. In the fall, the leaves are a gorgeous scarlet red. This hydrangea gives you quite a lot during its growing season. Gardeners are known to experiment a little and here is one of mine ~ hydrangeas in urns. 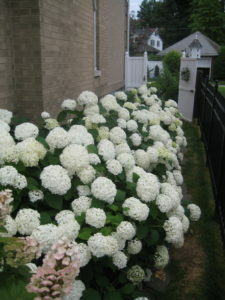 This is a wonderful way to enjoy the beauty of hydrangeas if perhaps your gardening space is limited. Now three years old, they live in the garage after the first frost until mid-March. On mild winter days (above freezing) they enjoy a little drink of water and in the spring they love their drinks of fish emulsion. But note: Mike refers to them as “Divas.” Because, if they do not have their water in the morning they scream ~ really you can hear them. And if you don’t hear them screaming you will certainly see their unhappiness by their extremely drooping leaves. My treasured poppies from France. The seeds were sent to me by a friend in Normandy. 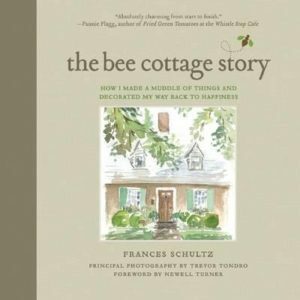 They were on her property when she purchased her home, which is over 200 years old. They like to seed themselves and always surprise me in the spring with their chosen, and often unique locations. Such as, between the walkway stones. 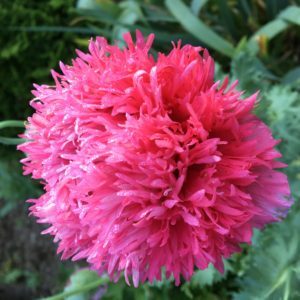 In doing a little research about these poppies, I believe them to be an antique rose poppy, an heirloom variety. They are rare. Delphiniums symbolize cheerfulness and goodwill. 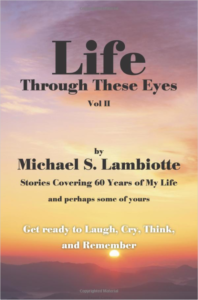 They are used to communicate encouragement and joy, as well as remembering loved ones who have passed. Delphiniums are also the official birth flower for July. 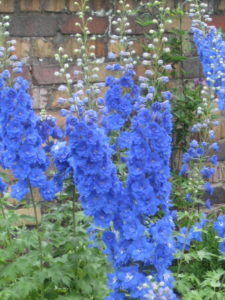 There are four main colors of delphiniums and their colors symbolize different meanings: Deep blue ~ symbolizes dignity. White, pink and light blue symbolize youth and renewal. We almost didn’t have these beauties to enjoy this year. A bunny, who I was so happy to see in our garden, decided to make his home with us. One morning, Mike came in from the garden only to tell me, “Your bunny has eaten to the ground two of your delphiniums.” After tasting a sprinkle of cayenne pepper, the bunny decided to move on. In closing, I hope you have enjoyed our ‘Summer Blooms.’ Please know how much I appreciate your visit and comments. Always feel free to contact me with any questions you may have regarding any post. Wishing you beautiful summer days! 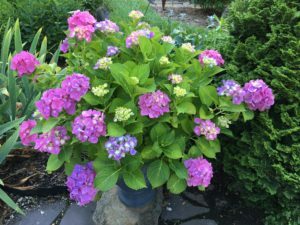 34 Comments on "Summer Blooms !" Rita, thanks so much. I love that peach/blush color also. 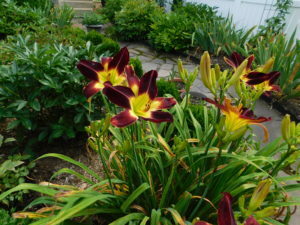 Those daylilies have been around. Cathy(my neighbor who gave them to me) was from Syracuse, NY. She moved them to Wheeling and on to Clarksburg. They are gorgeous every year. I am happy you are not having to water, it is the things in pots that I have to water. Wishing you a good weekend also, it is to be a little cooler before it warms back up next week! Your blooms are lovely. 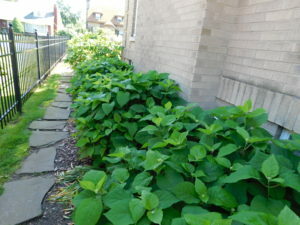 I recently planted my first Endless Summer Hydrangea. I am looking forward to it growing over the years. Thanks, Penny. I have never grown Endless Summer, but everyone I know who has loves it. It is supposed to be a wonderful plant. I’m drooling from the beauty….I know it’s not a pretty image ….those poppies….I tried to grow at old house….they walked away….literally…. So good to see you, Cindy. I love the poppies too. 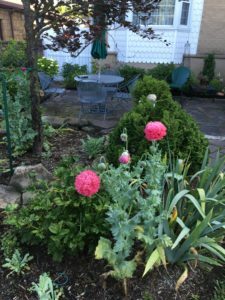 You didn’t realize you were growing your poppies for others to enjoy – I have had peonies walk away. Sandra, I so enjoyed seeing your beautiful photographs! 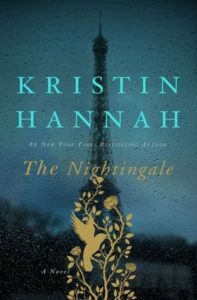 Those french poppies are so pretty, and what a wonderful story to go along with them. 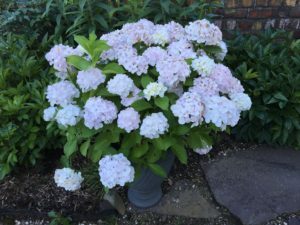 I have been wondering about planting hydrangeas in pots. I may try my hand at it. Thanks for the tips. Enjoy your weekend! Thanks so much, Shannon. 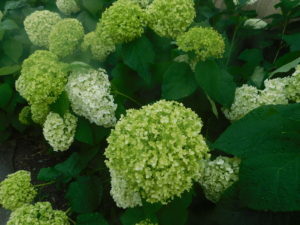 The hydrangeas in pots have done very well – I am sure they would for you also. They would most likely do better for you, as you have a good bit of shade. You may not have to be so careful about daily watering of them. Thanks for your visit and have a great weekend! 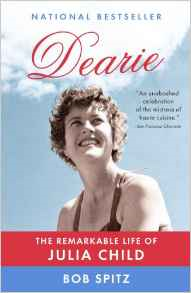 Dear Marcia – it is a dream for you to be here and walk with me. My dear, dear friend ! The poppies are amazing! I also love the Tribute to Mike daylily! Sandra, your garden is beautiful. The Annabelles are just stunning as are the delphiniums. Your photography is very good, I am still learning, I will never master it. Thanks for the beautiful walk. Have a beauty-filled weekend! 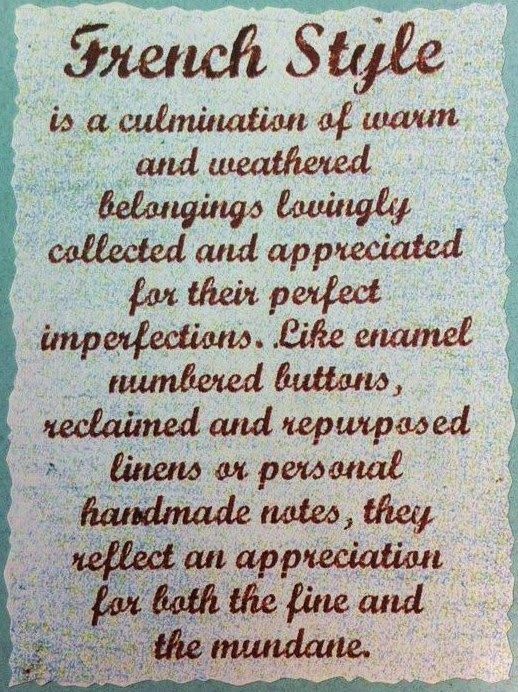 Dear Pam, I so appreciate your kind words ~ most of all your encouragement. You are the best, my friend! Have a lovely weekend! Oh my goodness, Sandra, your garden is a feast for the eyes. 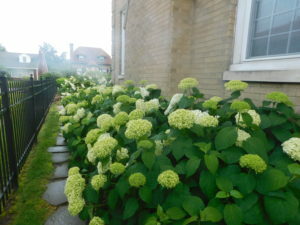 I love, love that walk way down the side of your house of the chartreuse hydrangeas. And your lilies are spectacular. Your French poppies are something else, no wonder you treasure them. Thanks so much for the lovely tour with accompanying post! Brenda, so happy you enjoyed the blooms. Thank you for your lovely words! What a pleasure to revisit this post my friend! 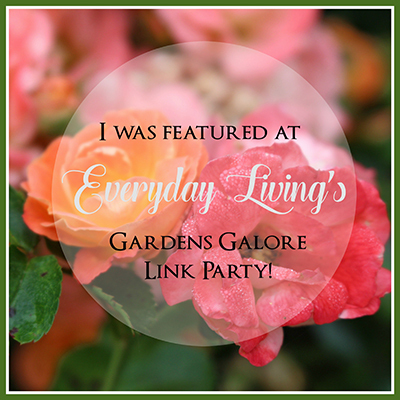 Thank you for linking to Gardens Galore! Thank you, Pam. It is an honor to be part of your Gardens Galore. I so loved your features from the last party. Sandra, I love your poppies(a great treasure from France) delphiniums, and Annabelles so much. 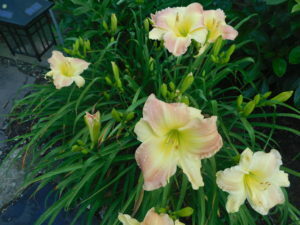 Your specimen daylilies are exceptionally beautiful. One of my friends did a beautiful arrangement with poppies and she also used the dried buds among roses and it was very attractive.I used to have poppies but they didn’t come up one year. I need to put that on my calendar and plant more. Many thanks, Bonnie. My mom was a National Flower Show Judge. 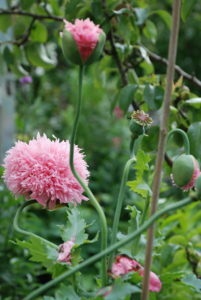 She would always use the poppy buds in her arrangements – she won many ribbons. I would imagine in your area the poppies would bloom really early, as they are not fond of hot weather. Thanks so much, Bonnie, for your visit. Such lovely gardens! I am so glad so came over to view them! Thanks for stopping by my blog as well! Nancy, so happy you enjoyed your visit. Hope you will come again soon. Hi Stacey, so good to have you visit. Your hydrangeas will take off, they are just thirsty girls and love their water. Happy Gardening to you, as well! Liz, thanks so much for your visit and kind words. I do love my poppies and where and who they are from makes them quite special to me. 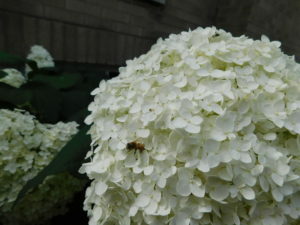 It is fun to watch the bees on the hydrangeas and until I had them I never realized how much the bees enjoy them. I have so much enjoyed the garden party, gardeners are the best people. If you send me a message with your address, I will share my poppy seeds with you this fall. Thanks again for your visit- have a lovely weekend! Wow, Sandra, I thought the daylilies were my favorite, then I moved on the hydrangeas and then the poppies. I love them all and thoroughly enjoyed my virtual stroll through your gardens. Happy gardening! Joanna, thanks so much for your visit and kind words. So glad you enjoyed your visit. Have a great weekend and happy gardening to you, also! Sandra, your Hydrangeas are breathtaking! I had one Annabelle. It got buried amongst other flowers and just about died. Not sure if I can revive it. If I do, I need to move it this fall. I love those Poppies. I had some similar for quite a few years at my previous home. The seeds were gathered at home that was hosting a yard sale. We inquired, and she graciously offered them. to us. Thanks for sharing with the Garden Party. Jann, so happy you stopped by for a visit. Thanks so much for your kind words. I’m sure you can revive your Annabelle – they are pretty tough. Moving it in the fall would be good and give it plenty of water, they are thirsty girls. Hope you will visit me again, soon! You have so much inspiration with the summer blooms in your garden. Your hydrangea are stunning. Thanks, Judy for your visit and your kind comments. Margy, thanks for your visit. We have had high heat and humidity also. It can be a struggle to keep things watered.